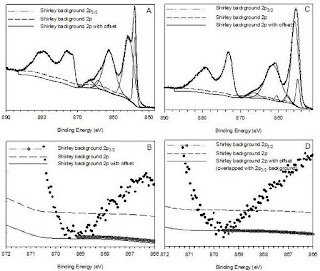 Curve fitting techniques for nickel species use specified empirical fitting parameters that take into account the unique peak shapes of the various Ni compounds[1,2]. 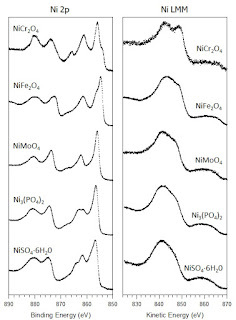 Spectra are fitted with the asymmetric line shape and plasmon loss peaks for Ni metal (Table 1 and Figure 1) and an empirical fit of the NiO and Ni(OH)2 line shapes from parameters derived from standard samples (Table 1 and Figure 2). The binding energy differences, FWHM and area ratios are constrained for each species. 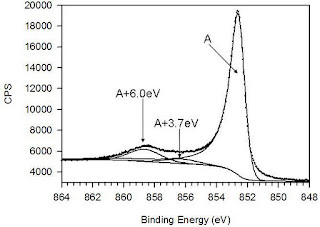 The absolute binding energy values were allowed to vary by ± 0.1 eV to allow for error associated with charge referencing to adventitious C 1s. 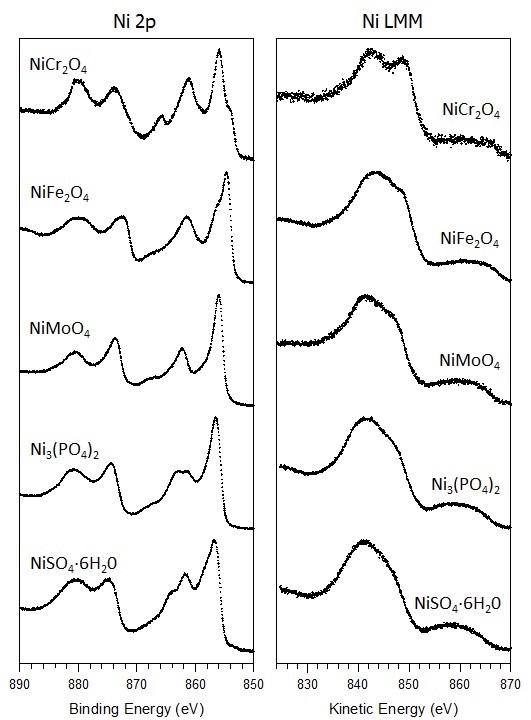 Overlap of the high binding energy satellite structure from Ni(OH)2 (and to a lesser extent NiO) with the 2p1/2 metal peak, which is composed of an asymmetric main peak and contributions from plasmon loss structure, can make the definition of an appropriate spectral background using only the 2p3/2 portion of the spectrum problematic. This work has shown that a Shirley background applied across the entire 2p (2p3/2 and 2p1/2) portion of the spectrum works reasonably well (even though fitting of only the 2p3/2 portion of spectrum is carried out). In many cases an offset of the higher binding energy end of the background can be used to improve the fit of the peak shapes. The appropriate background offset is determined using an iterative approach while monitoring a residual plot of the 2p3/2 area. It is necessary during spectral acquisition to use a window of sufficient width (848.0 to 890.0 eV) to accurately assess the end of the Ni 2p1/2 envelope for positioning of the background endpoint. Table 1. 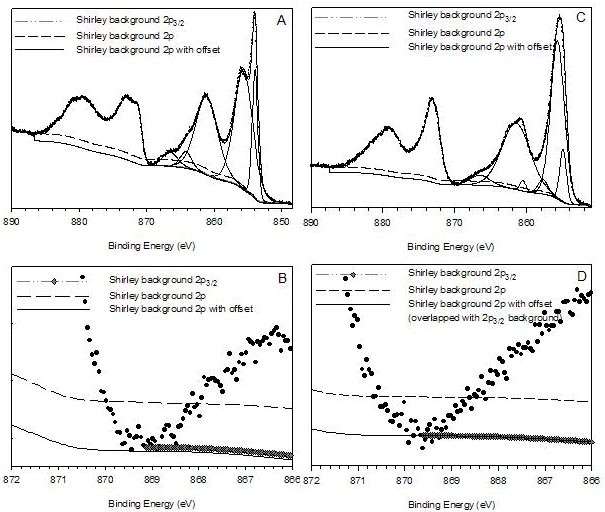 Ni 2p3/2 spectral fitting parameters: binding energy (eV), percentage of total area, FWHM value (eV) for each pass energy, and spectral component separation (eV) [2,3]. Figure 1. Ni 2p3/2 spectrum for sputter cleaned nickel metal . Figure 2. 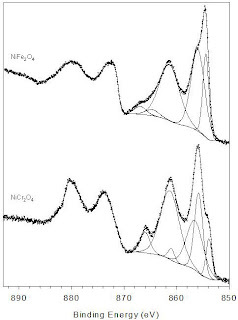 Ni 2p spectra of NiO (A and B) and Ni(OH)2 (C and D) showing three different Shirley background configurations. 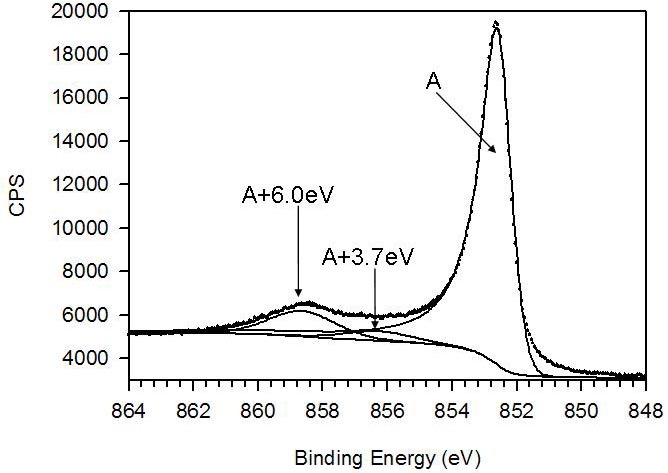 (B) and (D) provide detail on the backgrounds at the low intensity region between the Ni 2p3/2 and Ni 2p1/2 portions of the spectra for NiO and Ni(OH)2, respectively. The fitted peaks use the Shirley background across the 2p3/2 portion of the spectra . 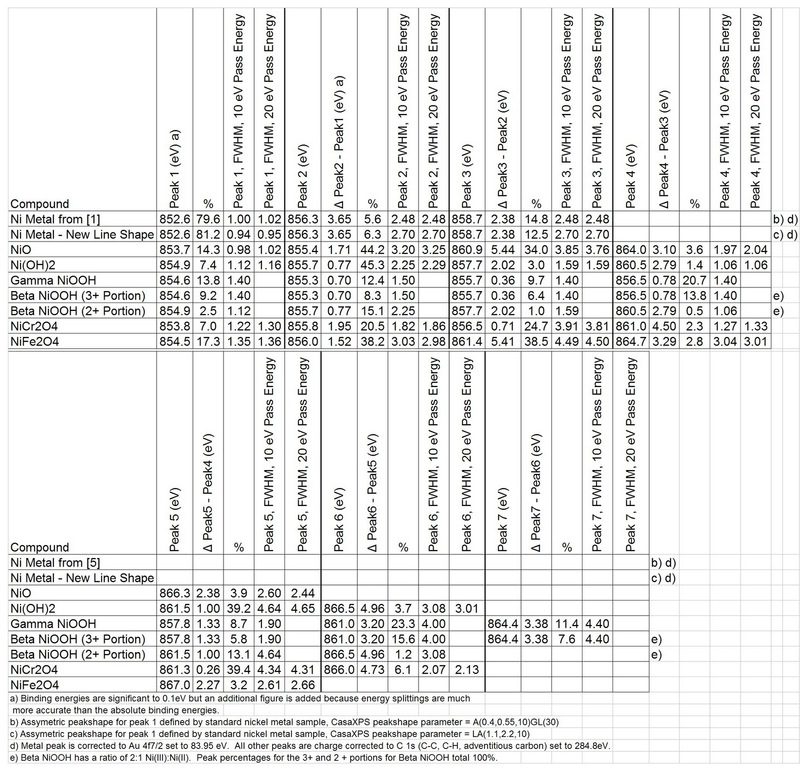 The work from  extends this approach to include fitting parameters for NiCr2O4 and NiFe2O4 (Figure 3), with fitting parameters also presented in Table 1. Ni 2p spectra of these two species are provided in Figure 2. 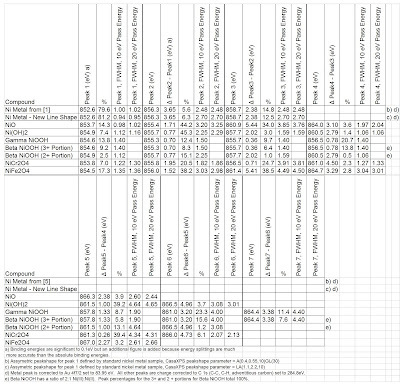 Fitting parameters for the nickel halide (NiF2, NiCl2, NiBr2] series can be found in reference . Also presented in  are Ni LMM Auger peak-shapes and Auger parameters for a variety of Ni species. Figure 3. 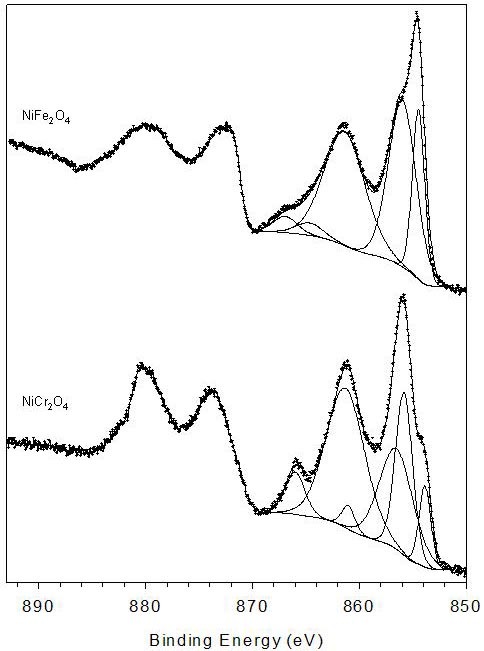 Ni 2p spectra for (bottom) NiCr2O4 and (top) NiFe2O4 . Figure 4. Examples of various Ni II species Ni 2p and Ni LMM peakshapes. M.C Biesinger, B.P. Payne, A.P. Grosvenor, L.W.M. Lau, A.R. Gerson, R.St.C. Smart, Appl. Surf. Sci. 257 (2011) 2717. M.C Biesinger, L.W.M. Lau, A.R. Gerson, R.St.C. Smart, Phys. Chem. Chem. Phys. 14 (2012) 2434.